Al Qaeda affiliates are suddenly now Islamic State (ISIS) affiliates, and entire groups of militants the US has been arming, funding, and training are “surrendering” to Al Qaeda, bringing along with them a large number of US weapons. Is this a failure of US foreign policy? Or is this simply a rhetorical means to explain away what appears to be an immense army of extremists the US is once again building up to direct at one of its enemies, just as it did in Afghanistan in the 1980’s? In a 2007 West Point Combating Terrorism Center (CTC) report and a 2011 CTC report, “Are Islamist Extremists Fighting Among Libya’s Rebels?,” AQIM is specifically mentioned as working closely with the Libyan Islamic Fighting Group (LIFG) and it was predicted most notably by geopolitical analyst Dr. Webster Tarpley, that even before NATO began dropping bombs on Libya that by doing so, they would be thrusting not only LIFG into power, but empowering a regional network of extremists, including AQIM. AQIM’s presence shortly thereafter in northern Mali, flush with weapons from Libya and a new sense of purpose as well as the fact that AQIM continues to menace the region years later is the complete fulfillment of this prediction. Both AQIM and LIFG are listed by the US State Department as foreign terrorist organizations (FTOs) but were in fact leading the fight against the Libyan government in 2011 with NATO weapons and air support. It would be France itself that would drop weapons into the country illegally to bolster their fighting capabilities during the conflict, and clearly, after the conflict both inside Libya’s borders and beyond them. Besides the propaganda value of the September execution by AQIM terrorists now operating under the ISIS banner, the atrocity illustrates perfectly that ISIS itself is not a “new” threat, but rather a very old and familiar threat simply repackaged and marketed anew. ISIS is clearly a conglomeration of existing terrorist organizations apparently from as far as North Africa to the Caucasus Mountains of southern Russia and everything in between. 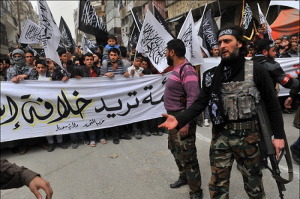 In addition to AQIM, Al Nusra and many other extremist factions either allied with or fighting alongside what the US calls the Syrian opposition, are also affiliated with and fighting in support of ISIS. This is basically what Al Qaeda was, before what can only be described as a marketing gimmick “ISIS” was coined. One Syrian rebel group supported in the past by the United States condemned the air strikes on Tuesday. Harakat Hazm, a rebel group that received a shipment of U.S. anti-tank weapons in the spring, called the airstrikes “an attack on national sovereignty” and charged that foreign led attacks only strengthen the Assad regime.The statement comes from a document, purportedly from the group, that has circulated online and was posted in English translation from a Twitter account called Syria Conflict Monitor. Several Syria experts, including the Brookings Doha Center’s Charles Lister, believe the document to be authentic. Groups the US was arming fought alongside, if not directly under, the banner of Al Qaeda. 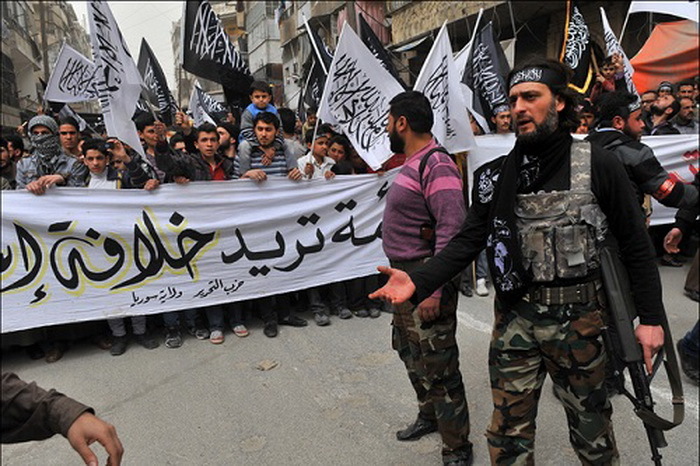 Claims now that Harakat Hazm “surrendered” to US State Department-listed FTO Al Nusra are clearly lies. It is only a matter of time before the claim “the rebels surrendered to Al Nusra” becomes “Al Nusra surrendered to ISIS.” The question will then be, how will the US manipulate the narrative once all that is left is Al Nusra, and it still refuses to effectively neutralize the organization and sanction its sponsors abroad. Ulson Gunnar, a New York-based geopolitical analyst and writer, especially for the online magazine “New Eastern Outlook”.